Seattle has a reputation for rain that has gone just about international. Everyone knows it rains all the time in Seattle, all year round, and that we're all desperately lacking in vitamin D here... right? Well, it's not untrue. Rain in Seattle is pretty commonplace. Our autumns and winters tend toward being pretty damp, but it’s not quite as bad as people make it seem. You'll hear people say it rains all year round here, which usually isn't true (though, some years, be prepared for the gloom). Most years, the summers are warm and dry, and some years the warm and dry weather starts in the spring. You might even catch cherry blossoms popping out as early as February! Whether you’ve lived here you’re entire life or are considering a move to the Great Northwest, knowing a bit about how often it rains here can serve you well. At the very least, a few bits of rain trivia can remind you that the sun will eventually come out. And that when it does, there are few places with more beautiful weather. How many days of rain does Seattle get in a year? How many days of sun? On average, about 58 per year, but many of our cloudy days feature what we call sunbreaks or some sun breaking through, so cloudy does not mean dreary or rainy necessarily. 37 inches, which is less than many major cities. Number of cloudy days each year? About 225 (most of them in the autumn and winter). What cities get more rain than Seattle? Several! 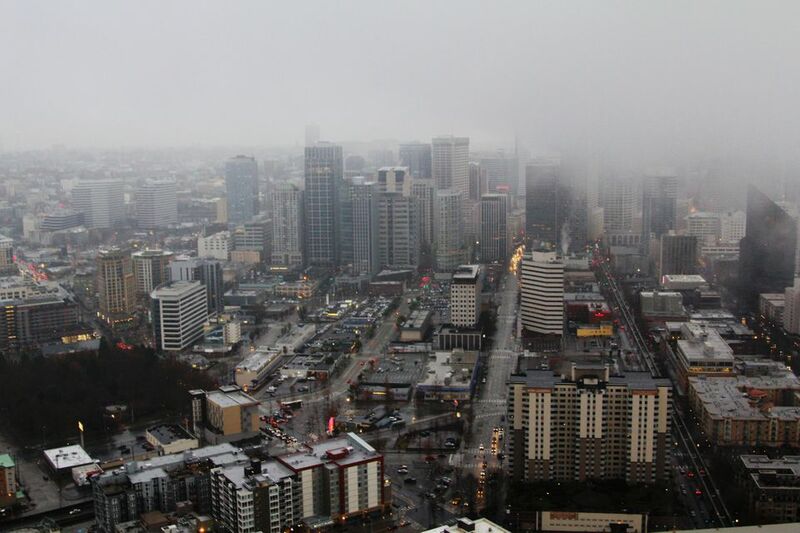 Chicago, Dallas, Miami, and even Portland all get more inches of rain per year than Seattle. Portland just edges Seattle out with an annual average rainfall of 37.5. However, Seattle is known for its steady, gentle rain rather than big storms where many East Coast cities get huge bursts of rainfall all at once. Some folks from areas of the country who are used to major thunderstorms might not even consider our usually gentle rain "real" rain at all. Who gets more rain—Seattle or Tacoma? Tacoma gets a bit more than Seattle at almost 39 inches per year. Olympia to the south tops them both with over 50 inches of annual precipitation. Do People in Seattle Use Umbrellas? This question will likely get you many different answers, but the fact is that Seattle-area natives use umbrellas far less than their counterparts in the rest of the country. There are no real statistics out there to support this statement—just look around on the street if you’re out on a rainy day. Sure, you’ll see a few umbrellas, but you’ll see a lot more hooded jackets. The reason for this is up to interpretation. The most likely reason is that it rains often here, and it rains for long periods of time, especially during the fall and winter. Carrying a soggy umbrella around presents a constant problem. Parts of the Puget Sound, downtown Seattle included, often also get high winds in the fall and winter. Carrying an umbrella in the wind and rain is generally impossible and more inconvenient than useful. A hooded jacket allows your hands to stay free to combat the wind as needed. It’s up for debate if not carrying an umbrella is a pride point for Seattleites or simply inconvenient. Do whatever feels right to you. No one will stare at you if you prefer an umbrella to a hooded jacket. Seattle is right in the path of a weather pattern that routinely brings in a lot of moisture off of the Pacific Ocean. Water evaporates from the ocean and is carried by weather patterns up over the Olympic Mountains, where it cools and the water droplets condense into the rain we all know and love. The Olympics create a rain shadow, which is most commonly over areas near Sequim — a small town northeast of the mountains that gets only about 18 inches of rain a year. To an extent, this rain shadow benefits Seattle. Yes, we get a lot of rain, but without the mountains, we’d get even more! Fortunately for when it does rain, there are plenty of things to do indoors. But rain doesn't stop Seattleites from getting out to do what they want to do. You'll see people out jogging in the rain, walking in the rain and generally going about their business. So don't be shy about putting on your rain jacket and taking a hike. If you don't want to take a rain walk, try visiting Seattle's museums, which are especially great on free museum days! There are museums in town or nearby for all tastes. The biggest ones include Seattle Art Museum, Museum of Flight, MoPOP and MOHAI, but choose your own adventure. If you're entertaining out of towners, the Seattle Underground Tour is covered for almost the entire tour. And whether you're local or from out of town, spending some time at Pike Place Market is always good for an hour or two out of the rain (and a good place to warm up with a cup of coffee or some fresh doughnuts from Daily Dozen Doughuts. Seattle also has plenty of indoor shopping at places like Westlake Center downtown, Southcenter Mall just to the south and the Bellevue Collection to the east, which is large enough to keep you out of the rain for quite a while as it includes not one, but three shopping centers all connected by covered walkways and sky bridges. You can also go see a show. Between the 5th Avenue Theater, Paramount, Showbox, ACT Theater and other venues large and small, there's always something on stage. If you really just need to get the kids out of the house, look toward places like the Family Fun Center in Tukwila, the Seattle Aquarium, Pacific Science Center or explore the Volunteer Park Conservatory.